Our Abpromise guarantee covers the use of ab18230 in the following tested applications. ICC Use a concentration of 2 - 10 µg/ml. WB Use a concentration of 2 µg/ml. 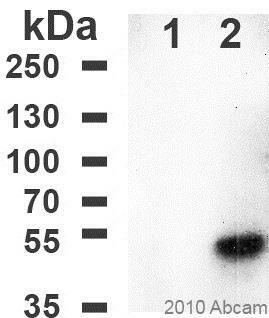 Detects a band of approximately 55 kDa (predicted molecular weight: 55 kDa). (c) Merge of (a) and (b) confirming nuclear localisation of the fusion protein. 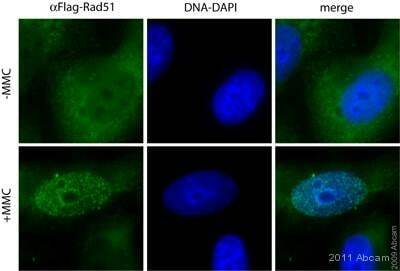 Immunocytochemistry/ Immunofluorescence - Anti-DDDDK tag antibody [F-tag-01] - (Equivalent to FLAG antibodies from Sigma) (ab18230)Image from Ögmundsdóttir MH et al., PLoS One. 2012;7(5):e36616. Epub 2012 May 4. Fig 1.; doi:10.1371/journal.pone.0036616; May 4, 2012, PLoS ONE 7(5): e36616. 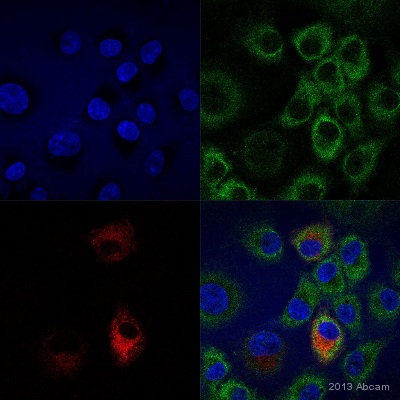 Immunofluorescence analysis of transfected HEK293 cells, staining DDDDK tag with ab18230 at 1/200 dilution. Auriez-vous des références d'anticorps à me conseiller? Nous avons plusieurs anti-FLAG anticorps au catalogue par contre aucun n’a été testé en microscopie électronique. Ces anticorps n’ont pas encore été testés en microscopie électronique et nous n’offrons pas d’échantillon gratuit à des fins de tests préliminaires. Cependant, si vous souhaitez tester l’un de ces anticorps en microscopie électronique, il me sera possible de vous offrir une remise. Après soumission d’une Abreview avec vos résultats, un avoir de la valeur de l'anticorps testé vous sera offert. 3. Nous envoyer vos résultats (positifs ou négatifs) obtenus sous forme d'Abreview (www.abcam.com/abreviews). 4. L'envoi de vos résultats activera le code et vous donnera un avoir de la valeur de l'anticorps testé. J'espère que ces informations vous aideront. N'hésitez pas à me contacter si vous avez besoin de plus de renseignements. BATCH NUMBER 335513 ORDER NUMBER 7241014 DESCRIPTION OF THE PROBLEM No signal or weak signal SAMPLE 3 different samples: 1. c-terminal FLAG-BAP (15 ng), 2. wildtype Arabidopsis seedling protein extract, 3. transgenic FLAG-fusion Arabidopsis seedling protein extract PRIMARY ANTIBODY ab18230 abcam - 1:1000, 2.5 hours, wash 3X TBST 5 min DETECTION METHOD ECL POSITIVE AND NEGATIVE CONTROLS USED see above...sigma c-terminus FLAG-BAP (15ng) ANTIBODY STORAGE CONDITIONS +4 degree (just got it last week, have not frozen it yet) SAMPLE PREPARATION all in sample buffer, heat for 3 minutes, spin, load 10 microliters AMOUNT OF PROTEIN LOADED 15 ng of control protein, roughly 3 mg total plant protein for plant samples ELECTROPHORESIS/GEL CONDITIONS 13% SDS-PAGE gel TRANSFER AND BLOCKING CONDITIONS semi-dry transfer to millipore immobilon-P PVDF membrane, blocked with 5% milk in TBST for 30 minutes SECONDARY ANTIBODY GE Healthcare ECL anti-mouse IgG HRP linked whole anitbody (from sheep) HOW MANY TIMES HAVE YOU TRIED THE APPLICATION? 1 HAVE YOU RUN A "NO PRIMARY" CONTROL? No DO YOU OBTAIN THE SAME RESULTS EVERY TIME? Yes ADDITIONAL NOTES We do a lot of western blotting, and know that all of our standard reagents and procedures are working (ie secondary anitbody, ECL detection, etc). The only step we could see changing if we try this antibody again would be using more antibody (ie 1:100) or incubating longer (ie overnight), but both of these ideas seem extreme just to get the antibody to react with the positive control! My biggest question is whether we should try a polyclonal since we have had such poor success with monoclonals (two failed monoclonals from sigma...one similar to this, where the positive control didn't work, and the other had very very high non-specific background)...if it turns out that abcam agrees that this monoclonal antibody is not working properly for what we need, would it be possible to try a polyclonal instead of getting a refund? Thank you for your enquiry. I am sorry to hear that you are experiencing difficulties with this product ab18230 in western blot. Often it is possible to make suggestions that help resolve problems. We will happily offer technical support and in the event that a product is not functioning in the applications cited on the product data sheet (and the problem has been reported within 120 days of purchase), and if it appears that the antibody is at fault, a replacement/credit note/refund will be offered. I have looked through the protocols you used and have a few questions and suggestions that might help you resolve the problem. If the suggestions do not prove to be helpful, would you please be so kind to confirm the following items in order to help me better understand the cause of the problem. Are your samples known to have sufficient levels for detection? We would normally suggest using around 20-40ug of protein per well. Most customers who use milk as a blocking agent tend to have problems detecting bands. At Abcam, almost all of our products have been tested with 5% BSA. Sometimes, a different blocking buffer might cause cross reaction between the blocking agent and antibodies, therefore causing weak bands or no bands at all. I would recommend trying 5% BSA, if you have not already done so. Also, cross reaction between the antibodies with the diluent could cause the lack of signals. We would normally use 1% BSA to dilute the primary and secondary antibodies. You can also use PBST only. Can you confirm you have reduced and denatured the sample at 95oC for 10 minutes in buffer containing SDS and mercaptoethanol? This will ensure the protein is in the correct conformation to run at the correct molecular weight and be detected by the antibody. Could the no signal you are experiencing be due to poor transfer of protein to membrane? Did you check the transfer efficiency? This can be simply done with a reversible stain such as Ponceau S. We have an abreview stating good results when incubated at 4oC and blocking with BSA. I would strongly suggest trying the same conditions for better results. I am sorry for the string of questions but I hope the above recommendations may already help you. If you have already tried the above suggestions and still experience problems, please do not hesitate to contact me with details of your shipping address/purchasing agent information and I will be more than happy to offer you a free replacement antibody of your choice. Can our customer use ab18230 to capture Flag tag? Your immunogen peptide sequence is very very similar to Flag with 1 a.a. difference! 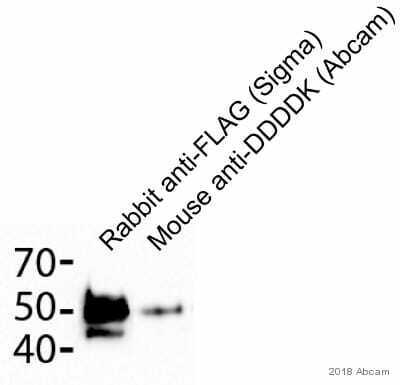 Thank you for your enquiry, we do not know if it will recognise the FLAG tag, we know this antibody will recognise recombinant proteins containing the DYKDDDK sequence.